Uttarakhand is extremely popular amongst tourists as a pilgrimage site for Hindus. From cave temples to several religious and historical places, Uttarakhand has a reputation of being a spiritual and religious site. However, unknown to common travellers, Uttarakhand is also a mine of natural marvels. From scenic beauty in the form of hill stations and valleys to natural wonders in the form of waterfalls and pristine rivers, Uttarakhand has everything under its arms which can surprise every visitor and allure every nature lover. How about exploring its waterfalls in Uttarakhand this season? One of the most popular and highest waterfalls in Uttarakhand is definitely Vasudhara Falls. Located at an approximate distance of 10 km from Badrinath and falling from a height of 400 ft, Vasudhara Falls should be your next destination if you are looking to enjoy the greenery surrounding the gushing down of waterfalls amidst the tuneful aura of nature. The major feature of Vasudhara Falls which attracts thousands of visitors is its trekking trails. You need to trek from Mana village through grasses and shrubs to reach Vasudhara Falls; consequently, making your journey more thrilling and exciting. Being a part of Alakananda river, the water of this river cascade has medicinal values and is considered holy by Hindus. Surrounded by the mountain ranges of Uttarakhand, Kempty Falls is another destination where you can find certain offbeat travellers exploring the hidden beauty of Uttarakhand. Falling from a height of 40 ft, Kempty Falls is a tiny waterfall on the hilly tracks of mountains. It is located at a distance of about 13 km from Mussoorie and is a year-round destination on account of its tranquil atmosphere dipped in calmness and quietude. If you love exploring hidden places, then Tiger Falls should be on your bucket list this season. Nestled peacefully at a distance of 100 km from Dehradun, Tiger Falls is popular amongst unconventional travellers for its beautiful oak trees surroundings. How about a trek to this hidden marvel in Uttarakhand which is falling soulfully from a height of 312 ft? Well, if you desire to sit delightfully and savour this majestic and alluring fall, then plan a trip to Uttarakhand now as this is the best season to visit waterfalls. Running down through the rich vegetation of dense forests in Uttarakhand, Corbet Falls is one of the hidden beauties and certainly boasts of its pleasant surroundings. Corbett Falls is located at a distance of 38 km from Nainital and falls from a height of 70 ft over luxuriant plains of Uttarakhand. Over a period of time, it has become an ideal destination for birdwatchers and photographers too. 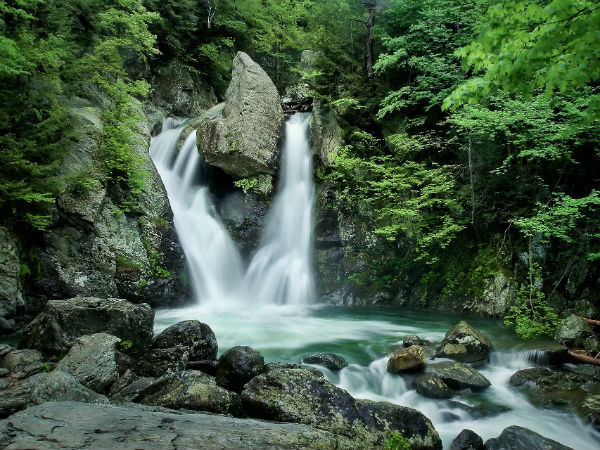 How about taking a stroll around this magnificent water cascade?